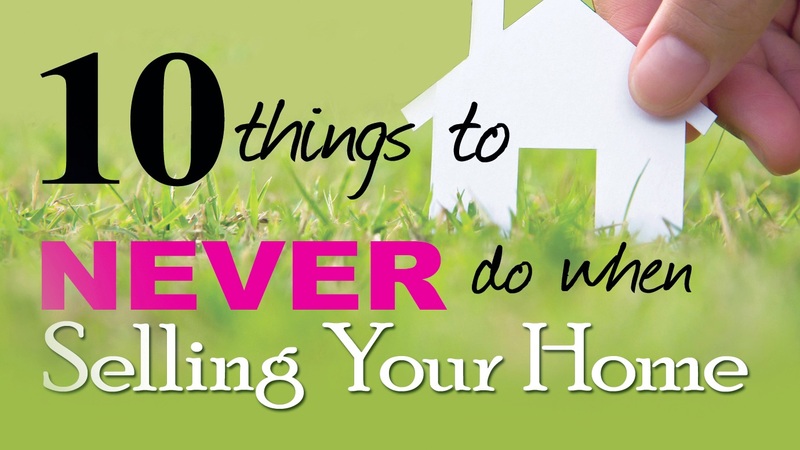 Here is my list of the top 10 things that home owners should NEVER do when trying to sell their home. Buyers fall in love with a lifestyle, or the dream of a better lifestyle in a new home. But they’ll never do it in your home if all they can see is YOUR lifestyle. Remember this one important point: Most buyers are already living in cramped homes with overcrowded closets, clutter and worn-out features in their homes. So the last thing you want to show them is that life is exactly the same in your house as it is in theirs! Take away most of the personal photos. Remove dirty clothes from chairs and floors. Pick up toys and piles of paperwork. Make the beds … every day! Close the cupboard doors and all drawers. If you have anything that looks like it needs fixing, or gives the appearance it will involve work and/or money to repair or upgrade – you are leaving yourself open for lower offers or no offers from potential buyers. Buyers subconsciously assess a problem and attach a higher price tag to fix it than it will actually cost. And they will subtract that price from any offers. Go through your house and make up a list of all the jobs that need doing. Then work through them methodically, and be sure to hire a handyman for any jobs that you can’t handle yourself. I OFFER FREE HANDYMAN SERVICE FOR ALL MY LISTINGS! You will never get a second chance to make a first impression – and that’s why staging your home can make the difference between “for sale” and “sold”! Staging involves decluttering your home, and helping buyers see the best features and spaciousness of your home. Remember that buyers often can’t see this for themselves; you must show them how a room can be used. Staging also ensures that your photos perfectly express the lifestyle that buyers are seeking. I AM A PROFESSIONALLY TRAINED HOME STAGER AND WILL STAGE YOUR HOME FREE OF CHARGE WHEN YOU LIST WITH ME! Remember that great feeling when you walked into a beautifully decorated showroom? What made that feeling special was that you could picture yourself in that space. To replicate that feeling for buyers coming to your home, be sure to remove overly personal décor and neutralize your space to appeal to the broadest audience. Your personal photos need to be boxed up and stored away for your next home. And if you’ve decorated one of your rooms as a hunter’s man-cave, remove the deer heads! Remember that many buyers won’t relate to a hunter’s man-cave, but nearly all buyers can relate to a room that is staged as an office or getaway TV room. Try and make the buyers feel welcome and want to stay in your home, while visualizing themselves in the space. Pack away your personal items for your next home. Decor is a very personal choice – and while you may love your bright orange kitchen walls, a buyer may be so put off that the whole house will lose its appeal. We are still in a buyer’s market, which means that too many sellers are competing for too few buyers. So sellers must ensure that buyers don’t feel there are too many changes to make in the property – and that includes painting. Repainting your home is the least expensive way to make the biggest impact with buyers. Use neutral colors like beige, gray and soft pastels. And don’t forget to repaint your trim so it looks fresh. For the cost of a gallon of paint, you will do wonders for your home’s perceived value. The biggest reason for moving is that buyers need more space. So if your home looks cluttered, as if it doesn’t have enough storage for you, then why should a buyer think it will have enough space for him? Clutter is the fastest way to shove a buyer out the door and onto the next house. Click HERE for a step by step guide to decluttering. When you are selling your home, you are competing with all other properties for sale in your price range. So take some time to look at the competition and make sure you stand out from the crowd. Make sure your home looks better, is cleaner, has better curb appeal, and is priced better than the competition. Buyers love bright, sunny rooms – so open those blinds and curtains and let the sun shine in. The room will automatically feel more modern and spacious. And if you have great views from any window in the house, make sure buyers see them as soon as they enter the room. Bring the outdoors inside by allowing these views to be seen. On the flip side, if you have bad views – like a commercial building or messy home next door – try to create a visual diversion for the buyer that takes his eye away from that view. Some buyers will never like your precious cat or dog, so don’t take it personally. But be realistic about your pet’s smell and do everything possible to eliminate pet odors. Keep in mind that many buyers may also be allergic to animals, so remove your pets from the house during showings if possible, and remove all signs of pets from the house – like pet toys, litter boxes and bowls of pet food. Do you have a spare room? One that is a dumping ground for stuff that won’t fit anywhere else? If so, then stage it as an office, a craft room, or an additional bedroom. But don’t let buyers see that you have space that is wasted, or they may think they are paying for a room that isn’t required. Always give every room in your house a purpose because buyers often don’t have the imagination to know how to use a room. CALL PATTI (434-660-9063) IF YOU NEED HELP GETTING YOUR HOME READY TO SELL.